A high-speed train service which could cut the journey time from Cardiff to London to 70 minutes is being considered in a study by First Great Western. A six-month investigation into the possibility of developing a new 200mph railway line to service Wales and south west England is underway. Researchers have already concluded that the project would involve the construction of a new route and have estimated the cost to be more than £15m. But following the announcement of the study, First Great Western was warned to concentrate on its customer care by rail chiefs. The service, which could take up to 10 years to complete, would be constructed in stages. 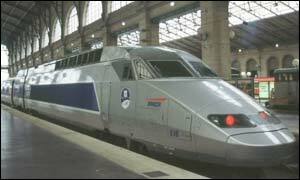 High speed train networks such like the Japanese Bullet and the TGV in France will be looked at. The study will also examine the possibility of using double-decker trains on the new line. Journey times to London from Wales and south west England will be significantly reduced if the scheme is given the go-ahead. The current two-hour trip from Cardiff to London would be reduced to 70 minutes and, passengers travelling from Swansea would have their journey cut by an hour. First Great Western hopes the study will convince the Strategic Rail Authority - who are already looking at a high speed line between London, the north of England and Scotland - to consider other routes. The report is expected to look at the possibility of constructing new interchange stations away from town centres. Dean Finch, managing director of First Great Western's rail division said: "South Wales has been the Cinderella of rail infrastructure investment for too long. "We want to champion a new generation of sustainable train travel. "A new high-speed rail service could transform economies encouraging inward investment, tourism and access to new markets." Mr Finch admitted that the current trains being used are outdated. "There is an urgent need to replace the existing First Great Western fleet now," he said. "All our research so far indicates that we would need to develop dedicated high-speed lines on brand new routes. "This would cut costs, avoid disruption and allow us to develop interchanges with excellent road access and parking," he added. However, the Strategic Rail Authority (SRA), which supervises the train companies has said that First Great Western should focus on the service it provides. A spokeswoman said: "Train operators do not have responsibility for national strategic planning. "This is the responsibility of the SRA and we may look into this in the future - after the 2006 franchise. "We feel that First Great Western's responsibility is to its customers. "We are keen that they continue to carry out their duty to their passengers," she added. Q&A: What now for Britain's railways? What do you want from the railways?